Like all Scripture the book of Job is the God-Breathed Word of God: It is profitable for doctrine; reproof; correction; and instruction in righteousness. 2Timothy 3:16 The Word of Truth is the ‘Incorruptible Seed’ – an incorruptible seed “which liveth and abideth for ever.” 1Peter 1:23. One seed -was planted in the book of Job… this seed that was planted and rooted in the book of Job, by the move of the Spirit of God. Job’s ‘Seed of Travail‘ – is growing, living and developing throughout all Scripture, until God’s fullest understanding that is hidden in these pages of Job, are fully realised. Only the Living Word has a creative, productive and enduring power to speak to all. First in Job – then it increased and multiplied through subsequent ‘holy men of God.’ – men who unveil the Word of Truth, until it becomes a living reality to all God’s sons. Again and again Job’s seed of travail, germinates and grows in a multitude of ways:- In Proverbs, Ezekiel, Jeremiah, Hosea, Habakkuk, Zephaniah – and Psalm after Psalm after Psalm. Prayerful reflection of every passage will start to uncover God’s way in you. Such examination will launch you deeper – into eternal intercession with the Lord:- For Jesus ever liveth to make intercession for them.” and so should we…. God takes each bond-slave. 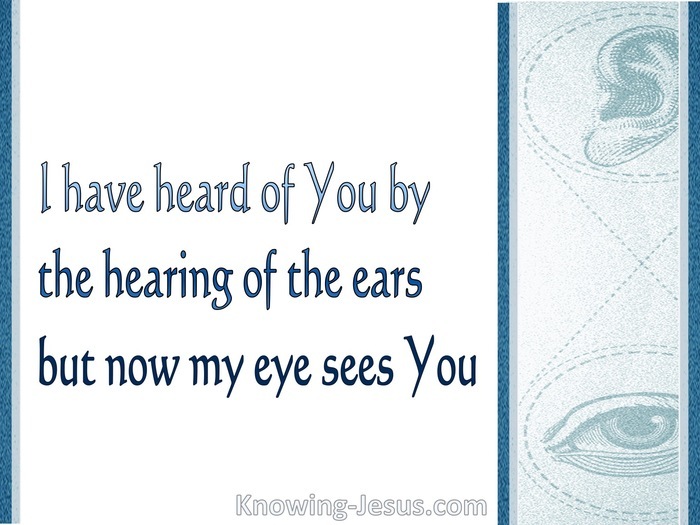 He prepares and chastens and purges each one, until they cry: “I have heard of Thee by the hearing of the ear but now mine eye seeth Thee.” . God will expose the roots of the old Adamic nature, with its prideful religiosity, until the old self-life is crucified and the new-life is transformed into His image. He will take your personal ‘seed of affliction‘, turning you into a ‘vessel of comfort’. Remember: “All who live Godly will suffer persecution” – just like Job…. But the choice is yours. God will never force his servants to submit against their will. You can choose His way or you can choose your way. You can say my will be done in my life – or Thy will be done in my life. 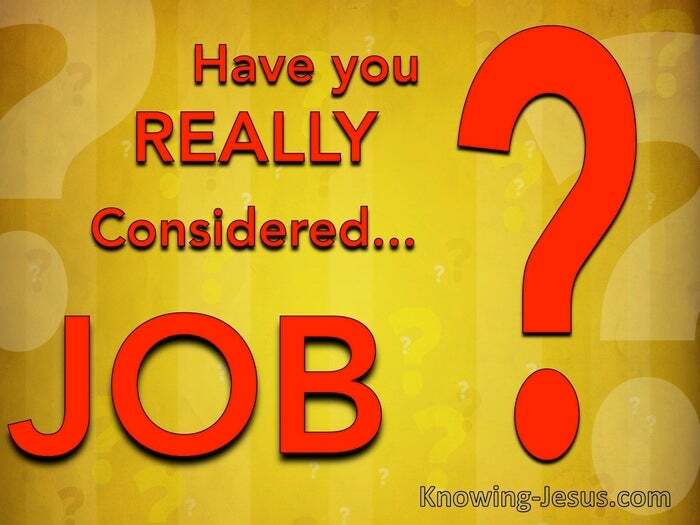 The Lord blesses all that endure like Job.. but likely not in this world for our citizenship is in heaven. And Job also was being prepared for an eternal ministry. God prepared Job to be His ‘Vessel of Comfort‘ – and you have that same choice. And Job has been engaged in the “Ministry of Comfort” – for the last 4000 years or more.. a lasting prayer ministry that cries: “Thy Will Be Done on earth as in heaven…” until God’s Way is completed and Christ is ALL in ALL. This has not happened yet and over 1000 years of ‘time‘ yet remains – before the start of the eternal ages to come. So… what think ye of Christ ? Have you really considered Him? Is it your deep desire – that He really does become ALL in all to you? Do you really understand that our light affliction, which is but for a moment, worketh for us a far more exceeding and eternal weight of glory? 2Cor.4:17. Have you considered Job? Have you considered God’s bond-slave that had to come to an end of himself? Have you considered what this same decision would mean for you – in your life? Have you considered how and why Job repented – in dust and ashes.. and the deeper, more intimate understanding of the Lord, that Job discovered? Have you considered that your trust in God may be like an uncut diamond, that the truth and understanding of God that you hold to – may yet be incomplete? Have you considered Job’s wife – overcome by the strain of Job’s calamities, and what it will take for you to be an overcomer in these difficult times? Have you considered Satan and his bloodthirsty attempts to shipwreck your life – seeking to halt the fullness of the knowledge of Christ becoming reality in you? Have you considered the prideful outcome of Levithan’s manipulative strategies.. seeking to influence the ‘religious’ nature of your ‘old man against God… that ‘old sin nature’ which prefers your-Self rather than God’s ‘Christ-Self’? Have you considered Job’s three friends, who walk in the flesh and not in the Spirit – where God accused them saying “for you have not spoken of ME what is right.”? Have you considered ‘These Three Men’ – Noah; Daniel and Job, who lived by faith – who were all beloved of the Lord and were all men after God’s own heart – who stood at ALL cost for God’s end; God’s purpose; God’s motive; God’s way? Have you considered what it would mean to you to become a vessel of God’s choice – a chosen vessel of God – to intercede and comfort those who are in need? Have you considered Paul’s “Job Experience” and his astonishing conclusion.. Have you considered these 5 things: infirmities.. reproaches.. needs.. persecutions.. distresses? Have you considered Paul’s final conclusion:- That for me to LIVE…. is Christ – that I must die to Self and let Him live in and through me? Have you really considered Job?